It’s already Friday! Don’t forget to come visit us at Herb Day on Saturday! 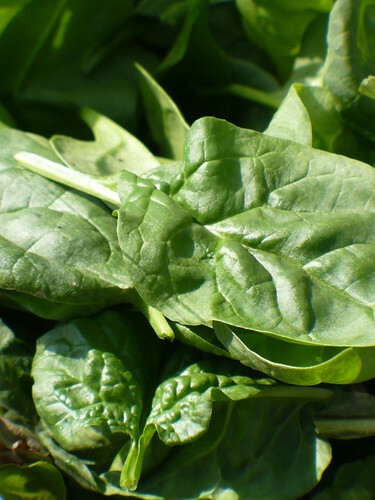 Those spinach leaves look so scrumptious up close. They make me hungry for a Spinach Feta Turkey Burger we made with fresh spinach a couple weeks ago. 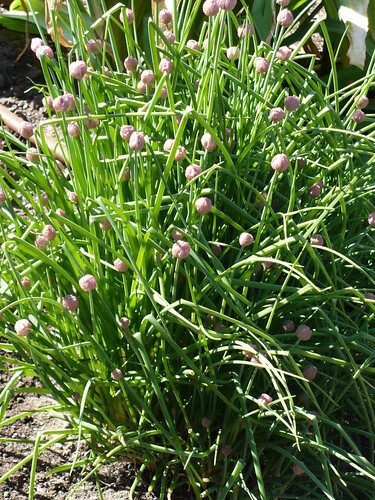 The chives are budded. I love the crazy lines of the leaves and the teardrop shaped buds. 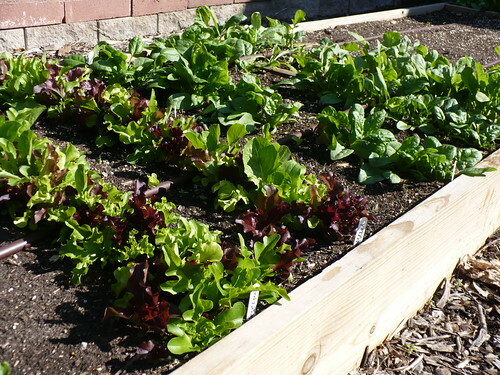 The lettuce and spinach tripled in size, I think, since last week. It is also very beautiful. Well…it was beautiful on Tuesday. I think I could make shredded salad right now. 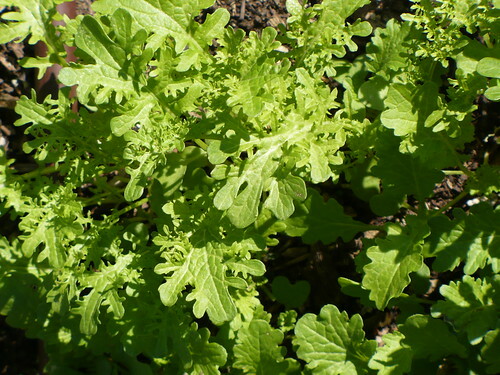 This Golden Frills Mustard in the Asian garden is just about big enough to start picking for salads. I really should look up some more “Asian” recipes to use with these greens, rather than just sticking with salads. Sheesh! I thought the wind was supposed to be gone today, but apparently not. The tomato and pepper seedlings are getting crazy big, and they really need to spend some time outdoors before planting. However, I’m not going to subject them to 50 mph gusts yet. After they’ve been out for a couple weeks it won’t matter. Right now…especially with all the tomato drama, I think the wind could pretty badly damage some of these plants.I can’t help but feel bad for the plants crammed under my lights though…I can’t raise the lights any higher! Enough whining about the wind and the tomato plants. We harvested a whole bunch of radishes, lettuce, and spinach from the Family of 4 Garden on Tuesday! We pulled the largest radishes, and ended up with about 7 bunches. 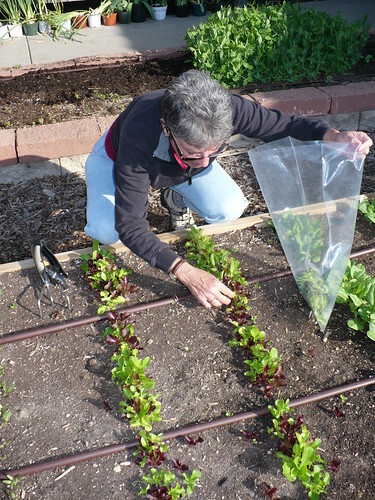 We also picked the largest leaves off the spinach and lettuce, which yielded about a pound of salad greens. Mostly the radishes are red ‘Cherriette’ radishes, but there are a few of the Easter Egg radishes left over from last year. 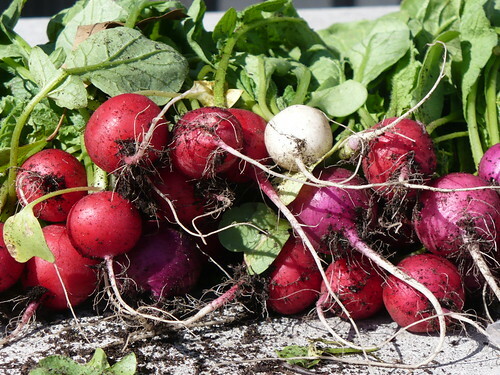 The huge volume of radishes is why it is more ideal to plant a smaller amount of radishes every week for several weeks, rather than all at once. I think 7 bunches of radishes is more radish sandwiches than I care to eat in one week! Anyway, the worst case scenario is that the spray could scorch the leaves, probably putting an end to our tomato experiment for this year. 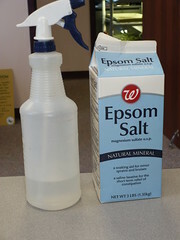 The best case scenario is that the spray results in some improvement of symptoms on the plants. Of course, between that would be no visible effects of either kind. No harm done, but no problem solved either. I would expect to see some change in a couple of days. I’ll keep you posted! P.S. 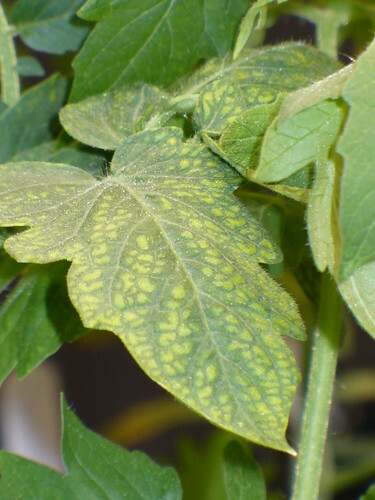 – I also sent 2 plants to the K-State Plant Pathology Diagnostic Clinic. We don’t think they’ll find anything, but who knows! Well, the saga of the pitiful tomato plants continues. I thought we had largely solved the problem with more careful watering and fertilization. Then I noticed that the very youngest seedlings are starting to show some of the same symptoms! These are the ones I planted on April 5th after the original seedlings were looking pitiful. Okay…this is ridiculous. 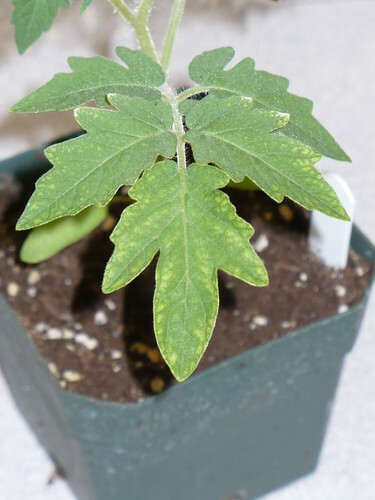 I looked at the older seedlings and saw a new “symptom,” which looks kind of like leafminer damage, but not really. 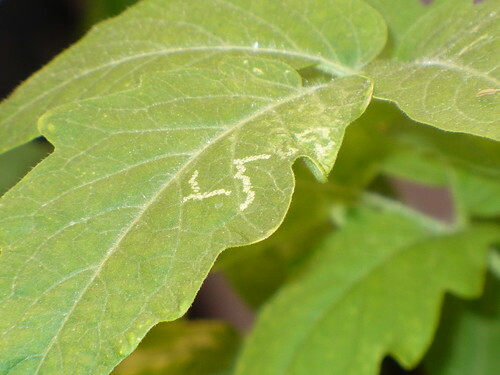 I looked at it under the microscope and it isn’t at all typical of leafminer. If this pattern on the leaves was in a print fabric, I’d be all over it. Well…maybe. But I’m not thrilled that it’s on my tomato plants! Anyway, I emailed several pictures to one of our plant pathologists for her ideas. the only thing we can determine that makes any sense whatsoever is a magnesium deficiency, and even that doesn’t make much sense. Normally magnesium deficiencies only show up in more mature plants later in the growing season. What I’m really concerned about is if there is any chance whatsoever that these plants could actually have some sort of virus that could cause problems in the garden as a whole this year. Even if it is just a nutrient deficiency, will these plants have the stamina to withstand diseases and the Kansas weather? Will they be productive? What this all comes down to is this…should we plant these tomatoes or pitch them? I’ll present the case to the Master Gardeners for judgment tomorrow! According to the rain gauge in the garden, we’ve gotten about 1.25″ of rain in the last 24 hours or so. That seems a little low to me. Maybe our rain gauge has a hole in it. At any rate, we’ll take the inch+ of rain. We definitely needed it. Our ‘Eversweet’ Strawberries are covered in blooms this year. 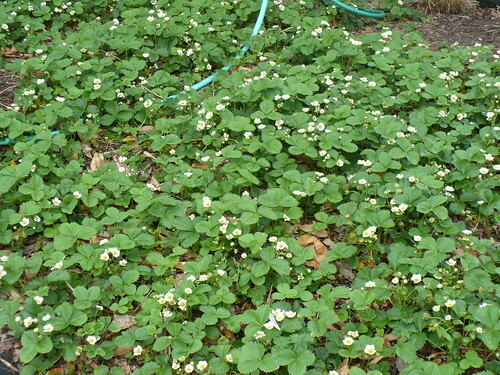 We are going to have a bumper crop of spring strawberries…or at least the mice will. Maybe there are enough this year that we will all get some! I had almost given up on this patch ever producing anything, but it looks like this year will be the winner. This is the ‘Hon Tsai Tai’ from our Asian garden. 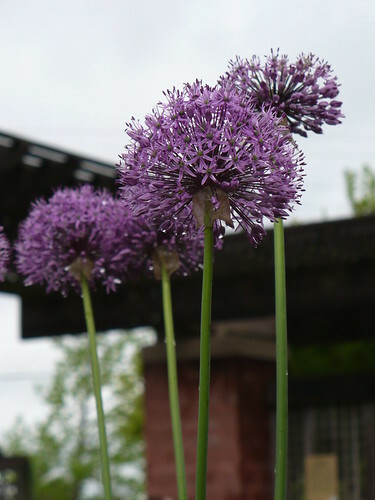 It has been growing pretty fast, and I’m loving the luscious purple color of the stems and young leaves. This is actually a type of Broccoli Raab, which I’ll be interested to see how long it takes to reach production. 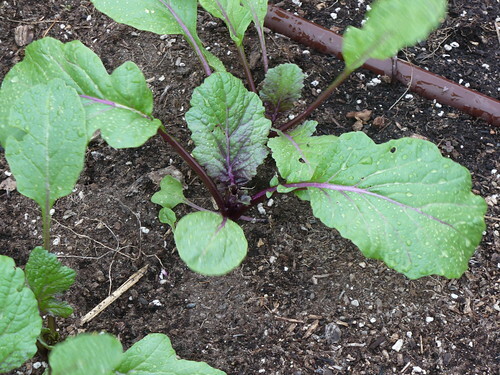 This Wildfire Lettuce Mix from Johnny’s is looking beautiful, if much smaller than our transplanted lettuce seedlings. A little thinning of the seedlings now makes for big, beautiful plants in a couple weeks. Sometimes the simple solution is the best. We’ve had some critter (I’m guessing a rabbit, maybe a squirrel) trying to dig itself a burrow down at the base of our oldest grapevine and the wood post. I filled the hole in 2 or 3 times. 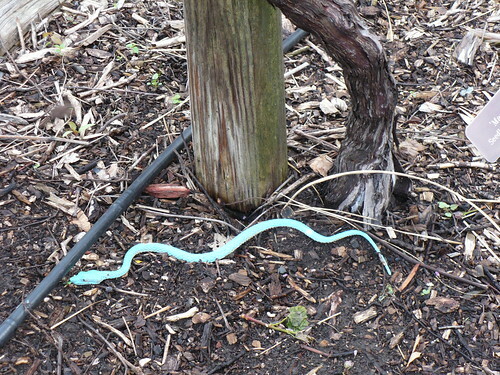 Then I decided that I would make use of the rubber snake that for some unknown reason has lived in our garden for at least as long as I’ve been here. I plopped him down where the hole was being dug…and so far there have been no more holes! I’ve switched to uploading the garden photos via Flickr, hence the suddenly bigger pics. I know posts like this one are going to slow down the loading for some of you. Unfortunately, I just wasn’t happy with the picture quality I was getting otherwise. I’ve also added a feed of the photostream, which you can find on the right sidebar, near the bottom.